Job suffered multiple losses�his riches, his health, his family, and his reputation. When his friends accused him of sin, Job asked, "How can a man be righteous before God?" (Job 9:2) and lamented that there was no mediator between God and man. When Jesus came to earth, that Mediator�the solution for man's unrighteousness�was revealed. 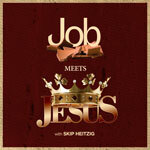 In this series, Skip Heitzig encourages us to trust God's purpose in the midst of suffering and presents the hope voiced by Job: "I know that my Redeemer lives" (Job 19:25).